The Facility for Rare Isotope Beams (FRIB) will be a scientific user facility for the Office of Nuclear Physics in the U.S. Department of Energy Office of Science (DOE-SC). FRIB is funded by the DOE-SC, MSU and the State of Michigan. Supporting the mission of the Office of Nuclear Physics in DOE-SC, FRIB will enable scientists to make discoveries about the properties of rare isotopes (that is, short-lived nuclei not normally found on Earth), nuclear astrophysics, fundamental interactions, and applications for society, including in medicine, homeland security, and industry. This video — The Facility for Rare Isotope Beams at MSU — explains the history of FRIB, its role in research and education, and its future in rare-isotope discoveries. It includes an animated sequence to help viewers understand what FRIB is about. Employment opportunities: FRIB is looking for engineers, physicists, and other talented professionals to build the world's leading rare isotope facility. Especially critical are experiments with rare isotope beams . . . Yet, the field is still in its infancy and limited by no access to the rarest isotopes . . . To address this limitation [requires] a next-generation Facility for Rare Isotope Beams (FRIB), which will deliver the highest intensity beams of rare isotopes available anywhere. FRIB will enable scientists to make discoveries about the properties of rare isotopes in order to better understand the physics of nuclei, nuclear astrophysics, fundamental interactions, and applications for society. As the next-generation accelerator for conducting rare isotope experiments, FRIB will allow scientists to advance their search for answers to fundamental questions about nuclear structure, the origin of the elements in the cosmos, and the forces that shaped the evolution of the universe. Located at MSU—home of the top-ranked U.S. nuclear physics graduate program—FRIB will join the DOE-SC family of “discovery machines,” world leaders in facilitating breakthroughs in our understanding of the world in which we live. 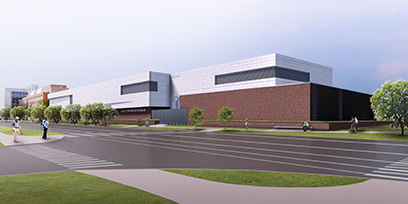 In creating this new one-of-a-kind facility, FRIB builds upon the expertise and achievements of the National Superconducting Cyclotron Laboratory (NSCL), a National Science Foundation (NSF) user facility at MSU. Since 2001, NSCL’s coupled cyclotron facility, one of the world’s most powerful rare isotope user facilities, has been conducting experiments on rare isotopes, elevating our understanding of nuclei to new levels. FRIB looks beyond NSCL’s discoveries to envision the next-generation technology needed for next-generation rare isotope experiments. The foundation of this vision—now the design of FRIB—is to use fast, stopped, and reaccelerated rare isotope beams produced by fragmentation to yield consistently high intensities of beams in minimal beam development times. FRIB is a complex, interdisciplinary enterprise that calls upon the expertise, aspirations, and resources of a host of collaborators. Its origin and ongoing operation rests on a strong partnership among DOE-SC, MSU, and national laboratories, all committed to fundamental research into the properties of atomic nuclei, particularly rare isotopes. FRIB also enjoys a strong partnership with future users, meeting with them regularly at events designed for planning, sharing information, and identifying opportunities. FRIB users—researchers from universities, industries, federal laboratories, and nonprofits from around the world—provide expert guidance to the FRIB Project team. From these partnerships radiate the networks of scientists and knowledge that will fulfill the promise FRIB represents. These networks will deliver discoveries, develop applications for society, and educate the next generation of nuclear scientists who will advance the benefits of rare isotope science for generations to come. View employment opportunities at FRIB. 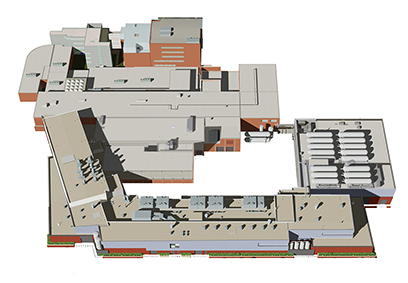 An architectural rendering shows the baselined conventional facilities design of the Facility for Rare Isotope Beams. An artist's rendering of the FRIB building as seen from the intersection of Bogue Street and Wilson Road.